Our BlocPower customer owns an 8-unit, 9,000 square-foot multifamily home in Brooklyn. The building, originally constructed in 1910, presents an array of energy and comfort issues, includes drafts, resulting from gaps in the building envelope and uneven heating throughout the building. In addition, our customer is hit with a $9,000 annual oil bill for space heating. The building’s inefficiency became the new normal for her, not because of lack of will, but because she had difficulty determining where to start. First, the old and inefficient oil-burning steam boiler needs to be replaced with a new energy efficient one. We also recommended an oil-to-gas conversion to accommodate a more efficient natural gas burning boiler. Second, we were able to recommend weatherstripping around doors and windows as a way to reduce drafts, heat loss, and wasted energy. BlocMaps allowed us to integrate city data and onsite observations and conversations to provide solutions in real time. This mapping tool gave our customer a jumping-off point to catapult her building into a greener future. She was overjoyed by the possibility of making energy efficient upgrades to her building and reducing costs. “I think God sent you down here to help me out!” exclaimed the customer as our team provided her with solutions. 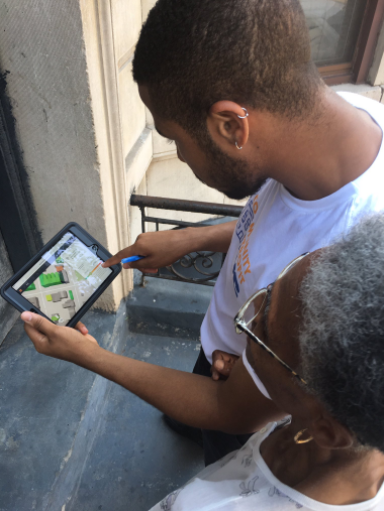 BlocMaps is bridging the information gap for our customers by providing them with energy technology, and we are excited to further deploy this product throughout Brooklyn. Email us to learn more: support@blocpower.io.